One unintended side effect of ridding myself of things is I’m now wary of procuring more. Everything I buy now has to be deliberate, considered, and necessary; lest it become something else taking up precious mental and physical space that needs to be carted around, sold, or disposed of at some point. Damn it, Type-Moon! 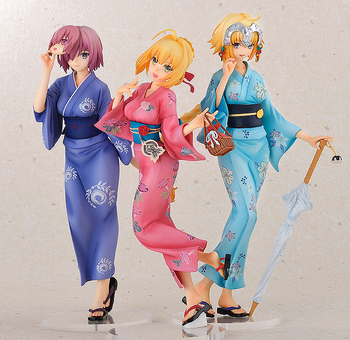 Mashu’s yukata even has the Chaldea logo on it! Fate/Grand Order is the first, and so far only, mobile game I’ve ever been able to get into. And it may be an obsession. For reference, the characters above are Mashu, Nero Claudius, and Jeanne d’Arc, linked to the wonderfully useful Grand Order fan wiki.